Subject: Leatherique to the rescue! I just used Leatherique for the first time this weekend, and had great results! It did a fantastic job of cleaning up and revitalizing 10 year old BMW leather, and my customer was thrilled at the turnaround. Here is a link to the post I made with photos. I've posted this on several forums, and have had a bunch of people ask for more info on your product. I simply sent them a link to your website. First, I want to express my total satisfaction with your product, and doing business with you. The color match was PERFECT!! The interior of my 1987 Ferrari Mondial Cabrio looks absolutely AMAZING!!!! It's not all put together yet as I am awaiting new carpeting that I will be installing before getting the rest of the interior put back, but all parts redyed (and there were a bunch of parts...everything from lower dash, glove compartment door, center console compartment door, upper and lower door side panels, all leather covered rear seating area parts, of course the front and back seats, and the center console itself) look like they are brand new parts!! All of your products are as good as you advertise them to be. I followed your instructions to the letter, and the results abundantly surpass my expectations. THANK YOU!! for providing the "dyi'ers" like me with products that make worth our time and effort. I have always said that quality of products used is key to producing extraordinary results. 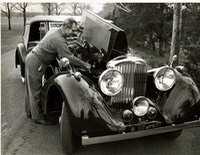 Leatherique Restoration Products prove this to be the case. I applied two coast of dye to all parts redyed. This left me with very little dye to have on hand for touch ups. In addition, I have yet to redye the boot for the convertible top. Therefore, I would like to order an additional pint of dye to take care of my needs. Again, THANK YOU!! for making these fantastic products available to us, and for being so supportive to your clients. FOR most car owners with leather seats, it is often a tale of love and hate. Leather, at its best, can be luxurious and comfortable, enveloping one in its supple comfort. However, more often than not, leather can be a bane to maintain at pristine levels. Scuffs, cracks, moisture (or the lack of which), dirt and smoke (cigarette smoke, in particular) all take their toll on the hides. Take my car for instance. The leather seats were factory fitted and arrived on our shores from the United Kingdom more than a decade ago. The leather itself was thick and of pretty decent quality. However, the passage of time and countless mileage showed with minor cracks and scuff zones appearing in the high contact areas. Over the years, I've tried many leather care products with varying degrees of success. Cue in Leatherique leather care products from the United States, with One Premier Sdn Bhd as the Asian regional distributor. 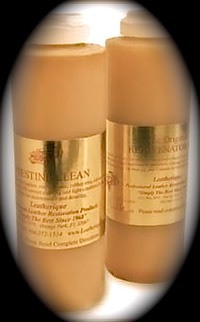 Leatherique offers a range of leather care products, covering basic maintenance applications to full blown restoration. Take for instance the Leatherique Rejuvinator Oil (RO). A proprietary family formula comprising a complex blend of animal proteins and collagens, the RO was hand massaged into the leather seats. The product has an inoffensive light oil odour not unlike olive oil. Extra attention was paid to the areas that come into daily contact like the head rests, side supports, etc. With care, it should take approximately half an hour to complete an RO application in a four-door car, including arm rests and leather door panels. The car was then left to sit in the sun for a couple of hours with the windows up, allowing the RO to seep into the leather. The after effects were quite shocking. Looking quite sleek just after applying the RO, the seats looked unpleasantly mottled after the afternoon bake. Spraying a few squirts of Leatherique's leather cleaning product, Prestine Clean (PC), onto the seats resulted in brown streaks forming. Wiping the seats down with a towel turned the white cotton terry cloth material an unsightly brown. Considering that these were seats that I'd kept relatively clean, it was amazing where all this dirt came from. Leatherique's website claims that the RO infuses the leather fibres and flushes out trapped dirt and other contaminants. The seats were slightly tacky after cleaning up with PC but the leather was now considerably softer and suppler whilst colour was also deeper. Mind you, these were the results on the original seats of a decade plus old car. Unlike some leather care products, Leatherique did not leave the seats slippery and slick, which could be unnerving and possibly dangerous to say the least. On the front two seats, however, it was an entirely different story. The front pair which had seen the most use over the years were showing cracks and substantial wear and tear. The RO helped to bring some life back into the cardboard hard hide but it was still relatively stiff. Leatherique claims that for really hard leather, multiple applications of RO will return some of the leather's original suppleness. Leatherique also offers Water-Based Leather Dyes.